36 Days of Type is a project that invites designers, illustrators and graphic artists to express their particular interpretation of the letters and numbers of our alphabet. A 36 day open call of restless creativity, where participants are challenged to design a letter or number for each day, showing the outcome of the ability to represent the same symbols simultaneouly and from thousands different perspectives. Once again this year and for the next 36 days, every designer, illustrator or artist is invited to put their own creative take on a letterform and share it with the world, as a global and simultaneous act of creativity exploring the boundaries of typography. As new for this #36daysoftype06 starting April 2, we are proud to partner with @adobe and @adobedesigners to celebrate together the art of type and lettering design all around the world, putting this collective act to an even bigger audience. In addition to our daily curated selection from all submissions, at the end of this edition on May 8 a panel of six international judges will pick the most unique, creative, or innovative letterform sets to award six winners a one-year Creative Cloud subscription for their 36 Days of Type submission. 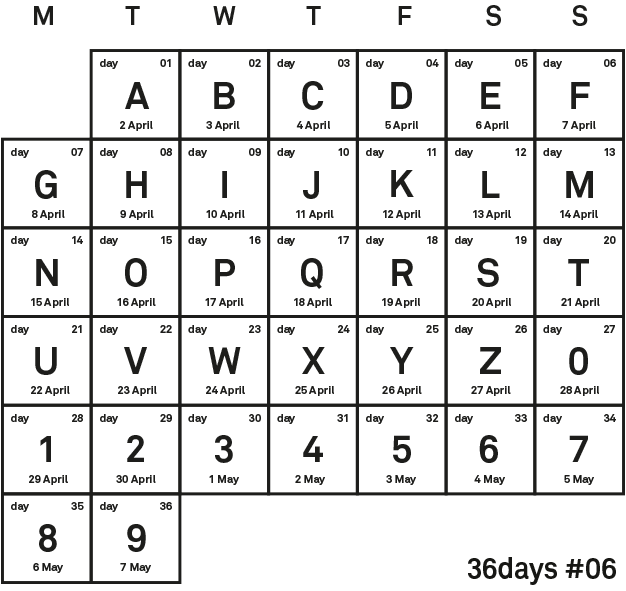 Tag your submissions with #36Days_Adobe and #contest to be considered. Full info here! For each edition, participants share their artworks via Instagram. To take part, first check the official dates in the calendar designed for each edition and then upload your contribution to your profile making sure its uploaded on its corresponding day. Always add the project hashtag plus the daily hashtag, as the only way for us to identify your artwork and allow it to be seen by others. From all the daily entries, a curated selection by our team will be published on the 36 Days of Type Instagram account, as well as other social networks related to the project. Multiple publications uploaded simultaneously using swipe are difficult to repost, specially when they include videos inside. Just consider this before posting. Also have in mind that typography and letterforms are the main interest of the project, therefore all works should be related. On it's release, the official calendar indicates the exact submission dates for each letter and number for the current edition. Please remember to upload your artwork on its corresponding day, using always the project's and the daily hashtags to register your work, and for a chance to be featured in our gallery as well as seen by others.